When Sandee Ferman was a little girl, a spritz of perfume left her with angry red welts on her skin. That unpleasant experience sparked a life-long passion for living a “non-toxic” life. Decades later, in 2014, Sandee turned her passion into a profession. She launched No Tox Life and developed a line of all-natural, handmade, toxin-free vegan body care products. Committed to creating products made only from “easy-to-pronounce” ingredients, the No Tox Life team uses food-grade, natural botanicals, powders and oils. Speaking of team, Sandee loves being at the helm of a women-owned business that’s also a family business. The creative director is Sandee’s daughter, Callie Milford. Here, Sandee and Callie tell us about running a small business that embodies and reflects their shared values and beliefs. Sandee and Callie will be selling No Tox Life products at the Bazaar at QB Connect 2018 in San Jose (November 5-7th). Click here to reserve your ticket today for this exciting event! Sandee and Callie, congratulations on running a mother-daughter business. Tell us how you decided to go all-in on working for yourselves – together! Sandee Ferman: I was brought up in a family business, so I learned about entrepreneurship from the beginning. Throughout my life, even when I was working for someone else, I was happiest when I approached tough job-related decisions from the perspective of, "What would I do if this was MY business?" Not surprisingly, I found things worked out best when I made decisions in the mindset of an owner or entrepreneur. Callie Milford: I was solo freelancing as a designer and marketer, so I was already an entrepreneur when I decided to join my mom in growing the company. Once No Tox Life grew bigger than one person could handle full time, I finished my other jobs and joined my mom to expand the business even more. We're now 20 times larger than during our first year in business and looking to double again next year. How did you go about turning your idea into a product? SF: I’d always been interested in using safe, “clean” body- and home-care products, but I didn’t have any professional experience making products from scratch. When I first started making bath and body products, I did thousands of hours of research and testing. I spent thousands of dollars on supplies to make test batches. Now we make about 150 different products for bath, body and home. CM: I've been an artist from an early age, and I’ve approached every job with the eye of an artist. How can this be better? Look more elegant? Be designed with flair? Have an eye-catching tagline? Marketing and design have been a huge part of that, and that's what I've brought to this business. What kept you going, especially in the early stage of product development? SF: Building and growing No Tox Life makes me feel like I’m actually doing something to help change the world for the better. I believe deeply in our product, and more and more customers are interested in switching away from the chemical- filled products available at big retailers. They want to find a safe alternative for themselves and their families. CM: People are becoming more conscious of what they use in their homes and on their bodies, and it’s great to see our brand becoming part of so many people’s routine. Our local customers in Los Angeles are organic, vegetarian, vegan, eco-friendly, zero waste-conscious shoppers who love to support locally made products. SF: Choosing the right e-commerce platform from the beginning would have saved us hundreds of hours of hassle and lost business. We now use Shopify which we love – and no one has paid me to say that! Figuring out how to find and hire the right people is so important, too. We have a great team, but it took us four years to really hone in on the best people for our business. CM: Selling consumer goods is very expensive in terms of overhead and startup costs. We’ve learned how important it is to price your products correctly from the beginning. You need to make sure you’re accounting for all the hidden costs. Tell us about the “mindset” that helps you succeed as self-employed businesswomen. SF: People who work traditional jobs go home when the workday is over. They can take vacations and have weekends off. Entrepreneurs have to work whenever it’s necessary, which might mean no regular days off for four years or longer. As an entrepreneur, you have to be able to get things done – not half done and not when someone else is ready to do it for you. You have to be willing to do what it takes to get it done. I think the best business owners consider the needs of everyone involved in any decision: other owners or partners, employees, customers and vendors. A decision may not be popular with everyone, but, with enough communication and understanding, the right decision becomes pretty clear. This is the heart of entrepreneurship for me. CM: I work all the time now, even when I watch a movie or walk my dog or go grocery shopping. Because I am in the personal-care industry, I even work when I take a shower in the morning. This might sound horrible, but, for me, it’s fun. I like absorbing the environment and noticing what is going on in the world and coming up with creative ideas. I have come up with product- and marketing ideas while driving, eating, listening to podcasts. When I’m away from work, I still think of new ideas. SF: We’re excited about connecting up with other business owners and getting our products in front of people who appreciate locally made goods. Who knows -- maybe we’ll even find a good investment partner to help us grow No Tox Life faster. Zero waste is the future! 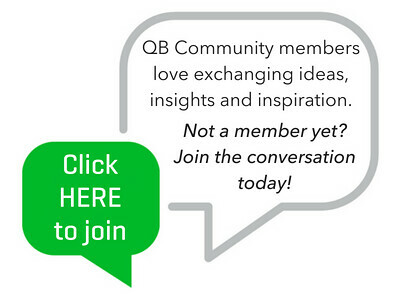 QB Community members, tell us about your greatest challenge when you were turning a business idea into an actual business!